I'm on a budget so the reasonably inexpensive NASA target SSB receiver fits my main criteria (value for money) nicely. Not only do I have full 30Khz to 30Mhz reception on sideband and AM radio but I can link it to my laptop (with a simple audio cable) for weather fax, NAVTEX and RTTY reception. Feature wise I couldn't ask for more. It has a small wire stand that raises the front of the radio on flat surfaces, but there are no obvious solutions for mounting the receiver permanently. My unit did not come with a mains power supply (just a wire pair to which I attached a male cigarette lighter plug). The instruction manual (which you can download here), is rather basic and a little out of date (when it comes to the software installation chapter it gives you DOS instructions), but the receiver is so easy to use that the manual is almost superfluous. People wanting a tidy setup for consistent and reliable reception while underway will need to look into purchasing a better antenna (the unit comes with nothing more than a long wire) and earthing arrangement, though I admit to having relatively good results with my ad hoc (hoist the antenna wire and tie the earth to the engine) temporary setups. Note that you may experience electrical interference from an alternator or inverter. I switch off the engine and use the laptop without it's power supply to get the clearest reception. 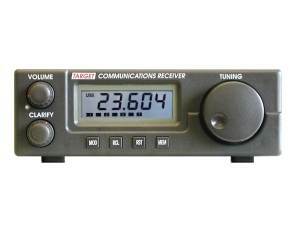 The Target HF3 does not have a backlit display, making it difficult to see frequencies at night. Unattended reception of weather FAX is not advisable as each new synoptic chart replaces the last (perhaps the full versions of mscan address this?). It's also slow (20 minutes for one chart) but obviously the radio or software can't be blamed for that. I have had excellent results with RTTY and NAVTEX reception. Despite the drawbacks detailed above, this is a great piece of kit and I recommend it (perhaps just as a backup solution) for anyone venturing out of WiFi or GPRS range. This has to be one of the most useful pieces of boating equipment, especially when sailing solo. I have read plenty of disparaging reviews by cruisers on how the current models tend to break down, leak, go haywire and more, but apart from a few instances confirming the reported berserk behavior (explained later) I have had two years of reasonable service from mine. In fact, I liked my tiller pilot so much, I bought a second one.... for redundancy.....just in case there was more to the previously mentioned disparaging reviews. ;-). The ST2000+ (for vessels up to 4500kg) and its lighter model the ST1000+ (up to 3000kg) are relatively inexpensive, (a quick search on the Internet will verify this), and they do work!. While the ST1000 should have been up to the task for my boat I guessed that it couldn't hurt to go one size up as added insurance for heavy weather. Calibration is a bit awkward (it has you literally sailing in circles) and there are times when the robotic helper just can't cope (e.g. too much weather helm) but despite these limitations, when you sail shorthanded, or just need a break, a robotic crew member is indispensable. The ST2000 is at its best when traveling under power in light seas, and I have successfully let it do the steering for long passages (around 300 miles) without incident, but there have been a handful of instances when without reason the tiller pilot switched over from automatic to standby mode, sending me off course. The only warning was a couple of barely audible beeps! I have no idea why this occurs but I have learnt to live with it. The only other minor issue is with the cable connectors, more specifically the plastic thread on the female socket. It's too light, so attempts by a poor sighted crew to force the plug in place have lead to some cross threading. A brief review of the Magellan eXplorist XL and the new Triton 2000 series of hand-held GPS. I have been using an eXplorist XL for two years and it really has proved itself to be an excellent GPS. Its rugged rubberized case has taken a beating and yet the unit is still working flawlessly. Its most impressive feature is the large display, essential when using it with the BlueNav series of navigational charts. When using your hand-held GPS as a chart plotter, generous screen real estate is a must. The only drawback was battery life. The XL uses 4 AA batteries and I generally get about 8 to 10 hours of use with quality alkaline cells (much less than stated on the specs) but it's never enough. No matter what GPS you buy, plan on going through an extraordinary amount of batteries, especially on long passages. This gets expensive, so unless budget is not a consideration switching to rechargeables is a must, even if battery life is reduced. I though I had an answer to the annoying switching and recharging of cells using the data cable with a USB power socket and running the unit off the boats main battery, but even this method has drawbacks. In rough seas and wet weather the connections get wet (surprise surprise), and while water will not make its way into the GPS itself, electrolysis becomes an issue. In about 10 hours of rough weather I did an excellent job wasting the data connectors. In future I'll only use this method in fair conditions and resort to the tedious battery changes when the weather turns foul. You can probably pick one of these units up on the second hand market but the XL is no longer sold by Magellan as it is superseded by the Triton Series. Which bring me to the Triton 2000 GPS. I also have one of these little beauties! Here is a GPS with everything, mp3 player, LED torch, digital camera, and a touch screen interface. Wow. While the screen is not as large as the XL it has higher resolution so screen real estate is not sacrificed even if the physical dimension are reduced. The Triton uses half as many AA batteries as the XL (i.e. 2) for the same up-time. Luckily all my old electronic charts (BlueNav SD cards) can be used with the new unit. What more could I ask for? Quite a bit it seems. First of all, what is the point of having an MP3 player and digital camera on my GPS if there is only one SD card slot? This is a real issue because of the hardware copy protection mechanism used on 3rd party SD cards. It is not possible to transfer charts to a larger capacity SD card so there is simply no room to store your music and photos. Either the GPS is used for navigation or it is used as a multimedia device. Both is a nono. 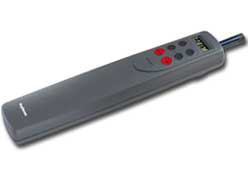 Another minus for this device (and this applies to the whole Triton Range ) is the bundled VantagePoint software. VantagePoint is used for viewing maps on your PC, getting firmware upgrades and loading tracks, points of interest etc. While much prettier than the older MapSend Lite used with the eXplorist, it does not display, and more importantly print, Latitude and Longitude. No more cheap paper charts from the home printer. The navigation screens are also rather basic, but nothing that I expect wont be sorted out in future firmware upgrades. A good example is the barometer function. Here is the potential to have a useful weather prediction tool and instead it just shows current pressure in mmHg! Figure that! The eXplorist XL firmware upgrades were excellent providing many useful display improvements. Lets hope Magellan keeps up the good work and does the same for the Triton series. A thumbs up for both the eXplorist XL and the Triton 2000 Series GPS. A must for the small boat owner.